Mikir:Tracing the genesis of the term. The raging debates over the renaming of ASSAM into ASOM seem to have subsided ‑ at least for the time being. This ‘needless blundering’ was foreseen as early as 1889 by Samuel E Peal in his ‘Note on the Origin and Orthography of River Names in Further India’. His observation is worth reading when he comments that the ‘…….names that were first spelt correctly, have been thoughtlessly altered, and unless taken in hand at once will become unmeaning, and at times misleading, fixtures. The word ‘Asam’, derived from the word Ahom, and which later is spelt ASAM by the Assamese themselves, is a case in point; formerly in all private and public correspondence and published works there was one ‘s’ only; but in an evil hour the spirit of innovation moved someone to alter the correct mode and gave us the unmeaning ss.’ This ‘unmeaning’ phenomenon has continued in the naming of the various tribes of erstwhile Assam. The term ‘Naga’ was coined in similar ‘evil hour’ that meant nothing to the ‘Nagas’ themselves. Mr Peal said, ‘The word “Naga” again, as applied to the hill tribes south of Upper Assam, is a more important instance of needless blundering, inasmuch as it bids fair to become a perpetual fertile source of gross mistakes in relation to these races.’ But the ‘perpetual fertile source of gross mistakes’ had been committed in relation to the Karbis when the tribe was named MIKIR that not only meant nothing to the tribe itself but was also derogatory at best. Assamese ‘historians’ like Gunabhiram Baruah chose to create a ‘Mikir’ out of the Sanskritic ‘Markat’ (meaning ‘eater of raw flesh’) just as the ‘Naga’ tribes were almost identified to be the snake-worshipping ‘Nagas’ of ‘Upper India’ between whom there was neither cultural nor historical relations or similarities. Thireng-Vang:reng (literally dead-alive, come-alive, thi=die, reng=live and vang=come) occupies a very important place in Karbi customs. Whether Thireng-Vang:reng is a historical person or simply a myth is quite a separate matter but he is credited with divine access to both the worlds of the living and the dead with equal ease. He is credited to have introduced the elaborate funeral rituals among the Karbis as he ‘knows’ both the worlds. In Karbi folklore, there is no mention that Thireng-Vang:reng ever had any children in ‘this’ world. Existing folklore mentions about Thireng’s wife ‘living’ in the ‘other world’ that explains his frequent visits to and fro. The theory of Thireng’s daughter, by the name Mekri, marrying a Naga prince is therefore highly ridiculous though inter-marriage among various tribes is a possibility. Furthermore, Thireng is neither described as a ‘king’ nor is there any mention of his worldly death in the Karbi oral tradition. This has been the most enduring hypothesis about the origin of the word Mikir. But strangely enough, there is no mention or reference to any such term in any of the surviving oral traditions of the tribe. The invention of a ‘lost-cat-seeking’ tribe must have been quiet an endeavor but this sort of ‘unmeaning’ had only created more social and political distortions in the later years that did more harm to the tribe than good. The ridiculous absurdity of the historian’s ‘analysis’ can be gauged by the fact that while he asserts that it was the Mikirs who called themselves so in the hope of getting love and gratuity from the Assamese, he also asserts that the name was given to the tribe by the Assamese. But in the same observation he had also vouched to the fact that the Mikirs indeed called themselves Karbis. The self-contradictory oversight in this case is all too clear to require any further explanations. The explicit racist tones are also all too glaring to miss when he calls the Mikirs as those ‘living in the branches’ (dalor Mikir) thus barely avoiding the direct application of the term ‘monkeys’ for the tribe. How a Sanskrit word ‘Sakhamriga’ or ‘Markat’ is so outrageously applied to give any semblance to ‘Mikir’ is anyone’s guess that could only be invented by a ‘pandit’ like him. These fabulous hypotheses had indeed created a force of acceptance to be treated as ‘history’ so far as other views had either been ignored, suppressed or not forthcoming. But how had the word Mikir received such a force of acceptance has therefore been an issue of intense debates in the Karbi society. What could be the etymological root of the term ? For, it would be naïve and simplistic to dismiss the term as the handiwork of some fertile brains. Our search for the meaning of Mikir or the nearest to it has led us to delve into the Karbi village traditions. 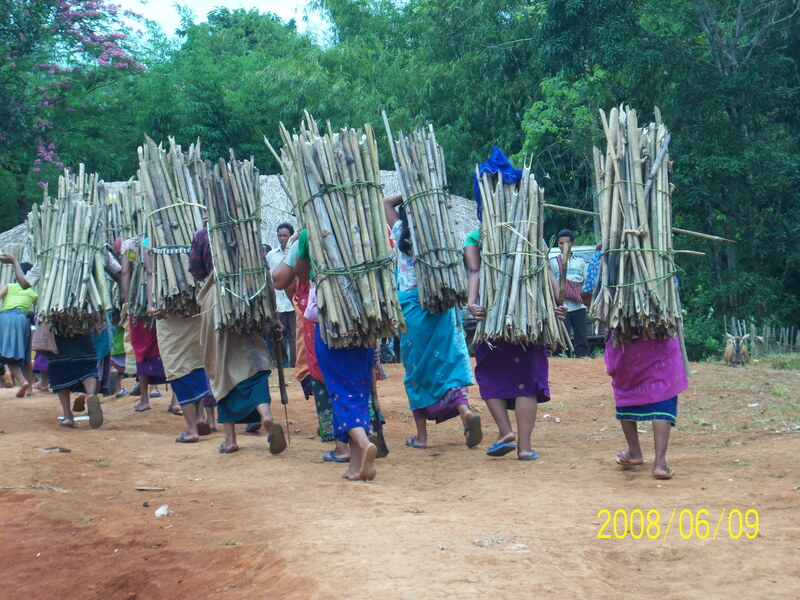 A traditional Karbi village or ‘Rong’ is organized around the institution of a village headman who is known as a ‘sar:the’ (among the Hills Karbis) and ‘bang:the/rong:the’ (among the plains dwelling Karbis). Members of every household of a village are known as ‘Mekars’. The senior-most of all the Mekars is known as the ‘Mekar Asar’ (Hills Karbis) who holds a particular position in the village court presided over by the ‘sar:the/bang:the’. The office of the ‘sar:the/bang:the’ has also other office-bearers with hierarchical positions who serve different purposes in the village administrative set-up to run the affairs of the village through democratic consultations. It could therefore be possible that a Karbi introduced himself to an outsider only as a ‘mekar’ or an ordinary member of a Karbi village. In a sense, every Karbi is a ‘mekar’ and in those days of communication barrier erected by linguistic differences, the outsider simply took the tribe to be only a ‘mekar’ which in course of time got corrupted to give the word ‘mikir’. The plains dwelling Karbis has an interesting story to tell. Once when the Karbis were shifting from the Dimasa kingdom to escape its oppressive rule, a certain ‘Kleng Mekar’ (kleng=elder or senior) was at the head of the group. ‘Kleng Mekar’ was credited to have been endowed with divine powers. According to the legend, a flame would emanate from the forehead of ‘Kleng Mekar’ that would illuminate the dark nights in the tribe’s flight through the thick inaccessible rain forests and hills and vales. Other account of the same story describes the ‘Kleng Mekar’ simply as a heroic and able leader who led his people against all odds to reach to the domains of the Ahom kingdom. He negotiated with the Ahom officials for the settlement of the migrating Karbis. Since ‘Kleng Mekar’ was only known by this name, it is highly probable that the Ahom officials took the tribe to be the subjects of the elder ‘mekar’ and thus popularized it in a new but corrupted name of the ‘mikir’. Historically speaking, various neighboring tribes had called the Karbis by various names with whom the tribe had continued periods of interactions in its migration and settlements in various locations across the North East. The Karbis, for a time had settled in the present North Cachar Hills district of Assam where they came into contact with the Dimasa people. A large group of the Karbis also migrated to the present districts of Jaintia hills and Ri-Bhoi under the state of Meghalaya. This led the Dimasas to consider the Karbis as not a separate tribe but ‘Pnar-sa’ or the ‘Sons of the Pnars (the Jaintias)’. How the Dimasas failed to see the Karbis as a tribe in spite of the two tribes living together in such close economic, political and cultural proximity for a long time in the same jurisdiction is quite another matter. But the Jaintias themselves used the term ‘Bhoi’ to denote the Karbis after which the present ‘Ri-Bhoi’ district is named. Still, the group of Karbis that came into contact with the Ahoms was named as the ‘Mikir’. Going by this pattern, there could well have been various other names given to the Karbis as they migrated across the lands of the Kuki-Chin tribes, Meiteis or Nagas and thereby cultivating a long history of interactions before finally settling down in the present Karbi Anglong district. The ‘MIKIR’ therefore is a direct derivation of the term ‘MEKAR’, far unlike the outlandish hypotheses that would make us believe. The rulers simply imposed the term ‘Mikir’ on the Karbis by inventing explanations which suited them. The plains dwelling Karbis had suffered such impositions since long as a Rong:hang was corrupted to Rahang, a Rongchehon became Rongchon or Rongson and Killing became Klien etc. It is a pity that the rulers’ tongue has continued to refuse to make a difference between a Teron and a Terang; in the rulers’ tongue the Karbi surnames fuse together to create quite another non-existant Karbi clan called ‘Terong’. Bordoloi, BN’s article ‘Karbis-their origin and migration’ appearing in the ‘Bulletin of the Tribal Research Institute’ Vol I, No III-1985 for Welfare of Plains Tribes and Backward Classes, Govt.Assam. Ibid Aham Buranji (1857) Reprint, by Gunabhiram Baruah. “Migration Memories in Karbi Oral Tradition” by Mr. Dharamsing Teron and presented in the ‘National Seminar on Tribes of India: Identity, Culture and Lore’, 5-7 September 2007, jointly organized by the Delhi University and Karbi Anglong Sarva Shiksha Abhiyan Samity. Informants Mr Owen Terang of Marme (Ri-Bhoi district, Meghalaya) and Dhireswar (Mina) Ronghang of Dokhinbam Karbi village (Tetelia, Sonapur in Kamrup). Informant Dr Motilal Nunisa, Director of Health Services (FW), Hengrabari, Govt. of Assam.